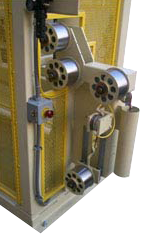 EIS manufactures Accumulators used in numerous manufacturing industries. 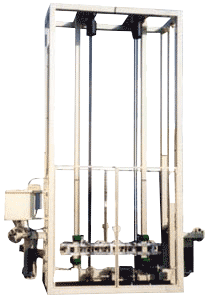 Our vertical In-Line Accumulator is fully guarded with dancer assembly and operating control panel. The In-Line also has a pinch roll to pull the extrusion through the machine, and a product clamp for welding. The typical wheels for the In-Line are 4" wide, although wider wheels can be provided. Typical accumulation had been 250 to 450 feet. In order to accommodate various products and accumulation requirements, these units are available in various heights and lengths. By custom design, we can tailor the machine to suit the customer's needs. 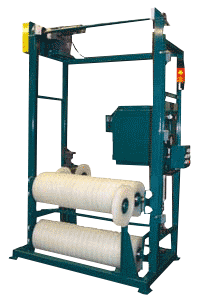 Featured on these units is free turning product rollers with traveling carriage passing below bottom rollers for easy product threading. Standard right to left operation with opposite direction available. 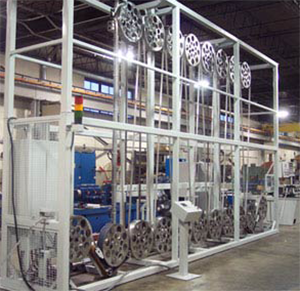 Variation in height and number of passes can be altered to meet customer requirements. Modification to roll widths and diameters are available for varieties of products. Rolls can also be of different materials to reduce product marking. 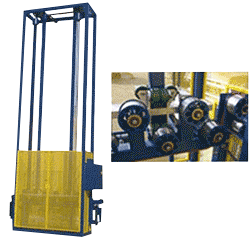 Rolls mounted side by side offer relative short accumulators minimizing floor space yet providing accumulation equivalent or greater than the in-line machines. These systems have many of the same features as the in-line machines such as a pinch puller, product clamp, dancer control, etc. An additional feature of this unit is to have the rolls on adjustable cams so that they will provide ease of tracking from one roll to another.